With the big Gear S2 software update earlier this week, Samsung delivered firm reminder that the smartwatch is not dead, despite obituaries having been written on numerous occasions. The update also emphasized that Samsung is taking this wearable thing rather seriously, and the company has today reaffirmed that notion by announcing a 3G-ready version of the Gear S2 classic. The fact that will harbor its own cellular connection is news enough, especially given that most of its peers rely on a combination of Wi-Fi and Bluetooth. But the real clincher is the eSIM tech -- the first of its kind in the smartwatch arena -- that will allow the device to be programmed to remotely select carriers without any physical SIM being swapped. Given the vast technologies on offer throughout the modern-day mobile market, the stone-age process of switching SIM cards for different carriers has remained. Apple has been the first recognized firm to try and push things ahead with the iPad Air 2, certain models of which include the Mac maker's own programmable SIM tech. Samsung is now looking to do likewise, but for the wearables market. The GSMA has just published its new eSIM specification for smartwatches, fitness trackers and tablets. Conspicuous by its absence is, of course, the smartphone. The GSMA says the wheels are in motion, but details of the specification for handsets will not be announced until June. Samsung's Gear S2 Classic 3G will be the first wrist computer in adherence to the eSIM standard. The newly-unveiled specification has huge backing from most of the main worldwide carriers including AT&T, Verizon, Vodafone, EE, to name but a few. A number of mobile vendors are also on board, including Huawei, Samsung, Microsoft and LG. Apple is not included, though. Having gone its own way to develop the tech for the iPad, it would appear that the fruit company is moving in alignment with -- but somewhat independently to -- the rest of the field. Apple is still said to be working in close quarters with the GSMA in aid of a SIM-less future. But given the firm's affinity to proprietary standards -- Lightning instead of microUSB; AAC instead of MP3 -- don't be surprised if Tim Cook's company takes the separatist approach once more. 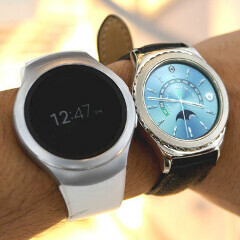 The Samsung Gear S2 Classic 3G, meanwhile, will be available from next month as Sammy continues to take the smartwatch bull by its proverbial horns. Gear S2 fans -- are you excited for the eSIM edition? Let us know via the comments! Damnit I knew it! I almost got the Gear S2 4g just b/c of the call taking ability. There has been a couple of times I wish I could have taken a call on my Classic. I figured there would be a 3g/4g version later, but I was impatient. Question for anyone who has a watch added to their plan. Will adding a watch make me get a new cell plan? I'm on unlimited. What carrier? On Verizon, yes. Your can't add the watch to an existing unlimited plan. Yeah, I should have mentioned. It's Verizon. I don't know who's more greedy Verizon or Apple. I wish I would have waited for the 3g classic personally. I used to try to take and make calls on my Gear S but the speaker was just to low to use. Hopefully this is fixed with the geas s2... I went with the non 3g model this go round. I have been waiting for the classic in 3/4g. I felt when at&t was giving the s2 out for free with a new Sammy phone that they may be in the works fit a classic coming up so I decided to wait a bit longer. I love the look of the classic so much more and being able to change the band is what I want. Keep the leather for the occasional dressed up time and get a rubber band for the every day use. Plus this will be a few days late of a birthday present for myself but well worth the wait. Blogs are wrong again. the existing Gear S2 3G Sport already uses an e-sim, and has been since it became available in November. The new part is the GSMA spec, which a number of carriers have agreed to use to make it easier to switch the device to another network. The other benefits are that the Gear S2 Sport 3G, which I have, looks a bit tech geek-ish, and the Classic model does not require the special (and very limited choice of) straps. It will be nice to be able to get leather or metal bands, instead of being limited to the Sport's plastic/rubber straps, which don't fit a lot of occasions. The current Sport 3G model has great call quality and a lot of improvements (especially Health sensors like HR) over the Gear S (which I had before this one). And it is great to be able to eave the phone home to run errands or go to the gym.